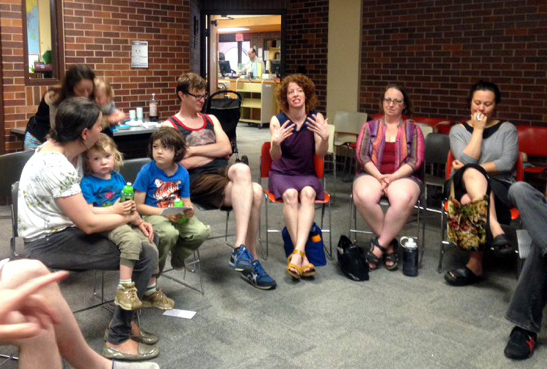 Creative parenting, Somerville style – how to be an artist and a parent? 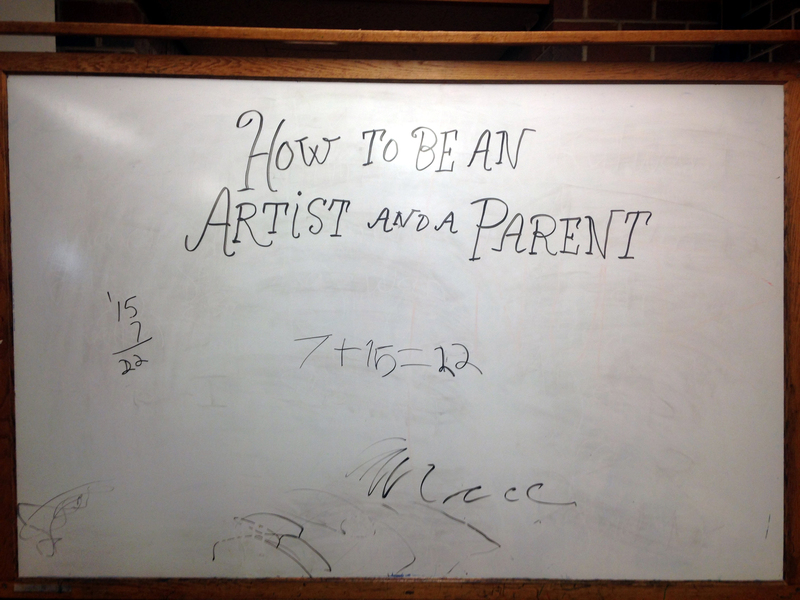 For the second How to be an Artist and a Parent event, Greg and I took the show to Somerville. Like the first event, we had three speakers, each giving 5 to 10 minute talks about how they juggle their lives, and then we followed it up with an hour-long group discussion. This time around, the speakers were Jef Czekaj, Jennifer Johnson, and Trudi Cohen. Jef is a children’s book writer and illustrator who has a two-year-old son. Jennifer is an actor and director, and works as the co-director of the Charlestown Working Theatre; she has an 11-year-old at home. Trudi is a musician with Second Line, one of the organizers of the Honk Parade, and a former Bread and Puppet member—and the mother of an adult son. 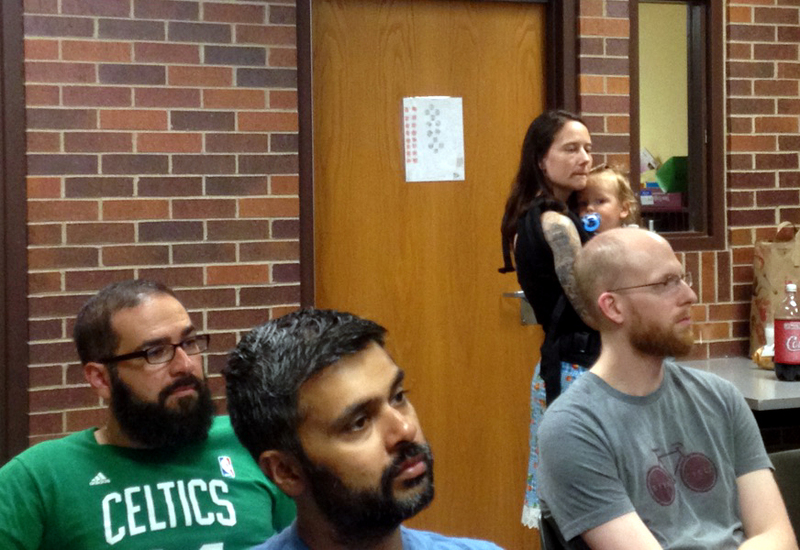 We were glad to have a good crowd, and very grateful to the Somerville Public Library for hosting. Not surprisingly, scheduling came up a lot. It’s hard to schedule creative time because it doesn’t have structured hours imposed on us by others like a regular job has. Add in the fact that almost all of us work in other fields, and creative work often becomes a neglected second job after a baby comes onto the scene. One of the problems is that it can be hard to justify creative time to your partner, or even to yourself. “It’s hard to say I need to think about the stars now,” Jef said, even though he needs to do that sometimes as part of his writing. His solution lies in the fact that he walks a lot with his son; this gives Jef space to think about ideas. Baby naptime can be a good time to make art, someone pointed out, just like the time at night after kids go to bed—although by that point, you’re pretty tired and just want to relax. A few people talked about how having limited time actually forced them to be more focused, which they counted as a blessing. Jennifer, for example, mentioned that her summers in western Mass. helped her a lot, since there’s pressure from others to work. But by the same token, it can be hard to work on demand, since so many of us find inspiration at random times. Of course, one way to get more time for your creative work is to involve your kids in whatever you’re doing. 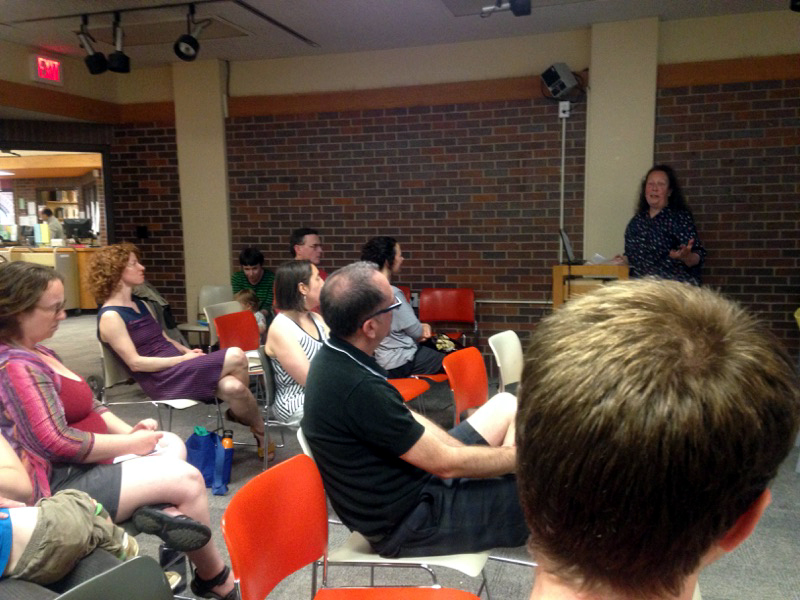 Jennifer talked about CWT’s kids programming, and how she and her husband involve their son as much as they can. Trudi’s son was also involved for a number of years with the performances that she and her husband did, although eventually he didn’t want to be part of their art anymore. But this can be dangerous, too: we heard about an adult son who had enjoyed meeting interesting people through helping his parents, but said he was bored and lonely a lot, and hated the expectation that he would help out. Jennifer said she began to spend more time producing other people’s work, since that’s still creative, but is less of a time commitment. She also collaborated with her husband more, since hey! he was there at the house too; their version of the Odyssey was developed at home over 5 years. Another person said that she began producing puppet shows for kids, since she now knew how much parents want kids programming and it seemed like a good opportunity. She said this was a little hard for her at first, since kids programming is generally looked down upon in the arts community—but that good work is always good work, no matter what people’s biases are. Which brings up identity—another theme of the afternoon. Once you have a kid, you might not be able to do anything creative for a while, so are you still an artist? This was something a few people hedged around; the consensus was that taking a break was ok, and that you can always come back to it. But the comments seemed rooted in a fear of losing a defining characteristic of yourself; if I don’t paint anymore, am I still me? One person said that she feels privileged to keep making art, since so many people drop out once they have kids. Like it or not, identity is often tied to other people’s expectations. Two people talked about what a competitive sport parenting has become, and how there’s pressure to spend more and more energy on your kid to make sure they “succeed”—which is a problem for all parents, including us time-strapped artsy folks. Coupled with the fact that a lot of people seem to think creative work is an indulgence, there’s a lot of social pressure to stop making art and conform to this new, skewed vision of what an ideal parent is. But a few people said their artist-parent friends understand that you can’t make childhood all about future success—there has to be lots of play. That raising a kid involves a lot of creativity, and that this is an important part of being a good parent—something creative parents can really excel at. You might not get to spend a lot of your energy writing poems, but you can always use that energy to raise your kid in a thoughtful, creative way. What will become of our kids? Trudi told us a bit about her adult son, which shifted the discussion towards the goals and outcomes of being a parent. Like all parents, us creative folks try to plan for our kids’ futures, and worry about what’s going to happen. One person said she wanted her son to go into another field, because she wanted him to avoid “that vague feeling of dissatisfaction that we creative people all feel.” But of course, parents have no control over this, so what crazy things will our rebel kids do to rebel against us—will they turn into (*gasp*) stock brokers? Another person told a story some kids who lived together in an large shared art household; some kids grew up to become musicians, while others became lawyers—but all of them seem to appreciate culture in some way. Interestingly enough, no one discussed saving for college or preparing a kid for a well-paying profession, which is something a lot of parents talk about when they discuss their kids’ future. Then there’s the space issue—which came up a bit because of how expensive our little city is. A few people mentioned having to get rid of their home studio to make room for baby, which affected how much work they can do, and what forms it can take. Jef’s solution is to keep all his stuff in a backpack, and go to local libraries to work. We’ve got a few events we’re talking about putting together, but nothing is hard and fast right now—so if you have any ideas, get in touch! We’d love for this series to grow into what people want it to be. In the meantime, we hope you’ll join the discussion on our Facebook page, or email list, if you haven’t already.